Driving south from Otorohanga we made a stop in Piopio for lunch at the Fat Pigeon Cafe. This is such a popular place for travelers to make a stop. It was packed inside and out. The waiting time was disclosed when we lodged our order and was pretty accurate. The staff were doing a great job under pressure. We concluded that many may be on their way to Womad, the annual music festival being held in New Plymouth that weekend. Piopio has a lovely little village green these days. I’ve never noticed it before. On to Tongaporutu, 15 kilometres south of Mokau. Growing up in Taranaki I’ve travelled this road many times, and driving south, I’ve always been fascinated by the row of little baches (beach/holiday houses) along the banks of the Tongaporutu River. Passing through though, we had never struck the tide right, or didn’t have the time, to walk out to the river mouth to see the Three Sisters. 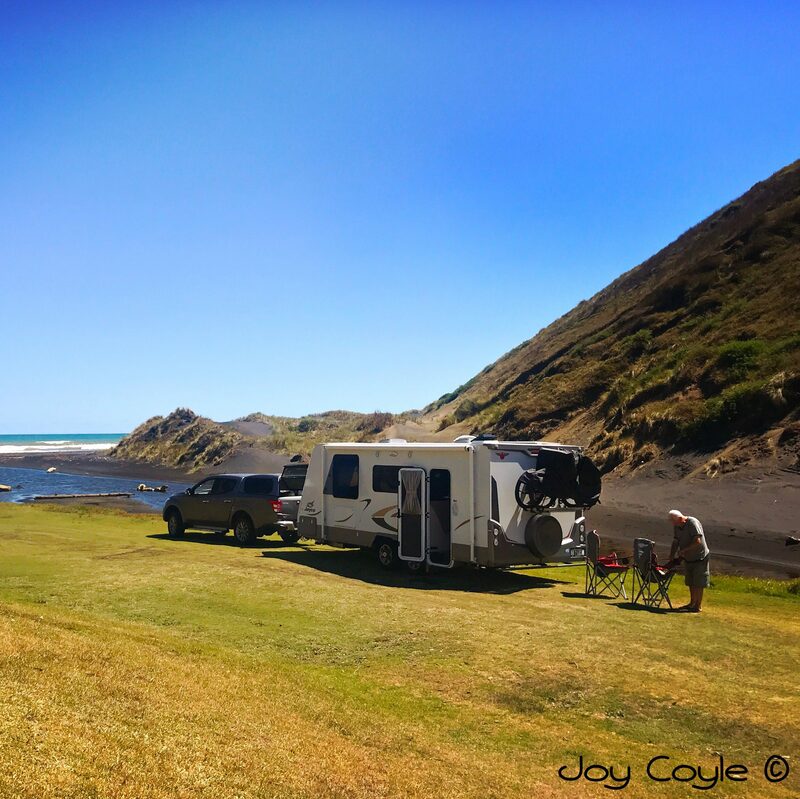 This time we resolved to stay the night in the Domain (freedom camping (#4104 NZMCA). I had checked the tide times before arriving fortunately as there is no wifi coverage here. Well, a little, but it’s unreliable and sporadic. Two hours either side of low tide is the time to go. When we arrived there were only a couple of vans, but by the evening about fifteen were parked up. It’s grassed uneven ground and parts may not be suitable all year round, but it’s a popular stop over. Next morning we set off to see them for ourselves. It’s probably only a leisurely 15 minute walk. It’s well worth waiting for the tide and taking the walk. I’m glad we decided to stop over. Very rewarding stop over. Excellent capturing. It certainly is amazing – we are going to have to do it again as we loved it so much.